Hard to believe we are coming up on the end of the first calendar year fiscal quarter already; some of us still have visions of sugar plums dancing in our heads! Lumber prices remain interesting to watch (to say the least), as we continue to be in limbo with any meaningful conclusion to or direction of the Chinese trade/tariff discussions. It seems this can is being kicked down the road a little, but maybe in this case that’s not such a bad thing – there remains some continued optimism that trade talks between our two countries may end up in a beneficial way. On February 24th, President Trump stated that because of productive trade talks, he would continue to delay an increase in tariffs on Chinese goods past the previously-imposed March 1 deadline. 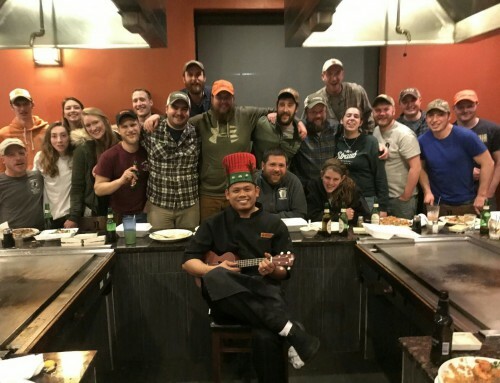 While this is arguably the current event that is having/will have the biggest immediate affect on our hardwood lumber prices, life goes on and our domestic market and other international markets continue to buy our quality hardwood products. Though the general observation from a recent Hardwood Weekly Review report (March 8, 2019) is that “sawmill production remains down from prior years’ levels as mills have reduced hours due to wet or cold weather,” it also indicates that US Domestic demand remains steady. 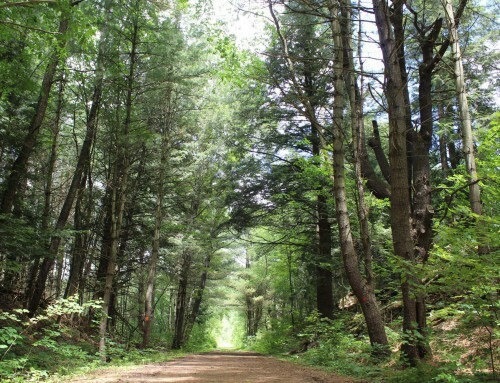 And, though China certainly isn’t buying anywhere near the level of logs and lumber from us that they were a year ago, they are still placing orders and it is said that the optimism of a pending trade agreement is bolstering some buying – particularly of red oak, white oak, and tulip poplar. 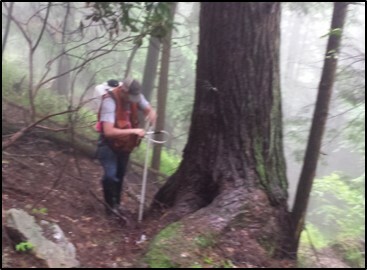 The latest news from our Appalachian Hardwood Region (basically OH, WV, PA, and southern NY) indicates that log supplies are improving for some mills, though the lingering winter weather interferes on occasion. Some mills are reporting that Ash logs are tougher to come by, especially as the quality of ash keeps declining. Ash lumber prices came up quickly in January and have been steady since the beginning of February. Cherry remains depressed, as prices have now dipped significantly below what they were this time last year – we believe that the direction cherry takes this year is largely tied to how China responds to our trade talks, and certainly if they still have an interest in that particular species. Hard maple remains at robust levels, indicating to some degree that the lighter wood shades are in vogue at the moment. The same holds true for red maple; we are actually seeing an upward demand/price trend continue since the beginning of the year. Red oak demand is also off as the markets closely watch the trade talks with China. Though red oak lumber pricing has slid fairly significantly since the first of the year, there is talk that if/when a new trade deal is made, red oak could possibly see a significant price increase again. 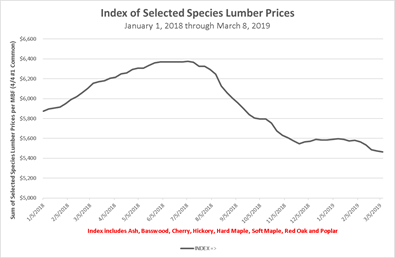 The two graphs that follow (Lumber Prices by Species and the Index of Selected Species Lumber Prices) demonstrate the swings we are seeing in the hardwood markets that are continuing through this year so far. 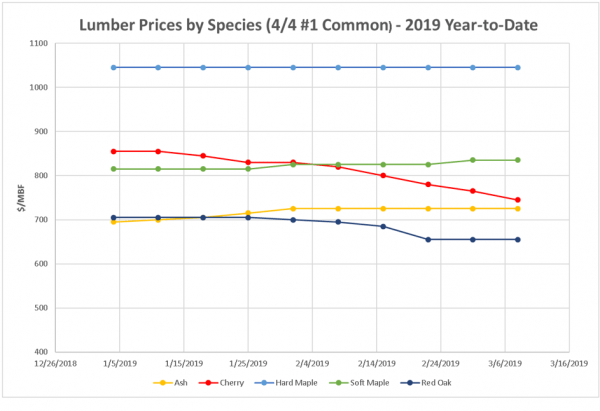 The top graph will show individual species trends, and the lower graph show the composite index of lumber prices for all 5 species in equal proportion. 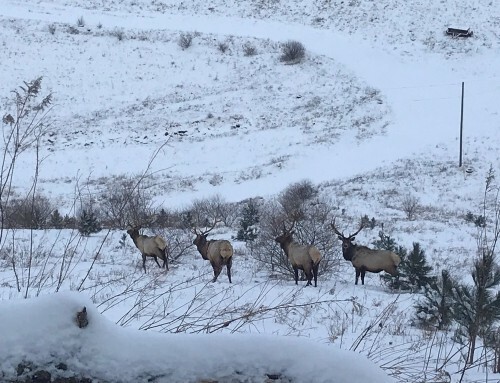 In times like these, landowners can still capitalize on good markets, especially if they align themselves with professional foresters who know the market fluctuations and have the landowners’ interests first and foremost. Please call any of our foresters if you are interested in selling your timber – you will be glad that you did!